Ditch the Negativity and Bad Friends Today! When you look at the people in your life, consider if they positively or negatively impact you. Throughout your teenager years, people will constantly bring you down, but do not try to compete or give into this pettiness. Follow Oprah’s advice by taking a step back and evaluating your friendships; then decide to be friends with only the people who do make you a better person. For the individuals who bring you down, cut them out. Sever any friendships that consistently make you unhappy. These individuals may kill your ambitions, promote bad habits, or constantly judge you, so learn to recognize them. You feed off of the energy of others and your relationship with them, so by recognizing that a friendship is bad for you, you can save years of wasted energy and time.Remember that friendships come and go and that it is a natural process to leave bad friends behind. These friends aren’t necessarily bad people (although some undoubtedly are), but rather, they simply may not be a good fit for you. By firing the people in your life who bring you down, you will experience great relief and will eventually be able to find happiness. You will develop more freedom and confidence in yourself, and you will have more time and energy to put into relationships with truly supportive friends who help you grow. You will be able to attract more open-minded people into your life, people who will help improve you as a person. The best qualities to carry in life include honesty and good character. In order to become a better individual and walk away from the friends who bring you down, it’s important to avoid their poor influences. If individuals are gossiping, walk away and do not participate. Refrain from watching, reading, or listening to negative attitudes and behavior, and make an effort to instill your positive energy into others. Before you decide to drop a friend completely, be open and honest with yourself and the person. If the other person is unaware of your feelings, this news may be devastating to them. Voice your opinions, and open communication to try to work out any problems the two of you face. After all is done, evaluate how true the friendship is. Ending a friendship can be scary, but realize that some things must come to an end in order for new things to begin, for things to change for the better, and for you to grow. You deserve happiness and success, so do not let others keep you from that. It may be difficult at first, but in the end, you will be much happier for it. 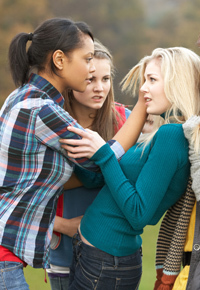 Surviving the teen years can be extremely difficult, especially if you are surrounded by negative influences. If things have gotten out of control, there’s no shame in admitting that you need the help of an expert. The qualified staff at Christian boarding schools are an excellent resource for helping you and your family through the trying teenage years. Specializing in treating troubled and at-risk teens, these boarding schools approach education with a balance of discipline and love, and their methods have helped countless teens transform into intellectually, emotionally, and spiritually healthy young adults.